On March 2, the Gas Pipeline Advisory Committee (GPAC) will convene a telephonic meeting to continue considering the Pipeline and Hazardous Materials Safety Administration’s (PHMSA) proposed rule that would amend safety regulations applicable to gas transmission and gathering pipelines. Topics to be considered include integrity management, record retention and repair criteria. The meeting is public; advanced registration is required. On December 22, 2017, the Department of Transportation (DOT) released a final report identifying regulatory actions that may directly or indirectly burden the development or use of domestic energy sources. Actions identified in the report, which was required by Executive Order 13783, “Promoting Energy Independence and Economic Growth,” include updating pipeline safety regulations to accommodate innovations in plastic pipe design and materials, evaluating whether more flexible siting requirements are appropriate for small-scale LNG facilities under Part 193, reviewing existing regulations for petroleum gas (LPG) operators with 100 or fewer customers, and reviewing the definition of class locations, examining policies for granting class location special permits and considering alternatives to pipe replacements when class locations change. PHMSA Rulemakings Update. The tables below summarize the status of pipeline safety rulemakings pending before PHMSA, as reflected in DOT’s October Significant Rulemaking Report and the Fall Unified Regulatory Agenda, released by the Office of Management & Budget’s (OMB) Office of Information and Regulatory Affairs (OIRA). The Unified Regulatory Agenda appears in two principal parts: Current Agenda Agency Regulatory Entries for Active Actions and Current Long Term Actions. New information appears in bold. PHMSA seeks comments on revisions to gas distribution annual report form. On January 25, PHMSA issued a notice and request for comments on proposed changes to an information collection that PHMSA will submit to OMB revising the Gas Distribution Annual Report Form (PHMSA 7100.1-1) and its instructions. The revised report form modifies the calculation of lost and unaccounted for (LAUF) gas to be consistent with the methodology used by the Energy Information Administration and allows negative percent values of LAUF. Comments to OMB are due February 26. PHMSA updates control room management FAQs. PHMSA has added new Frequently Asked Questions (FAQ) providing guidance for compliance with the control room management regulations under Parts 192 and 195 of PHMSA’s regulations. The new FAQs address individuals with authority to direct or supersede a controller’s technical actions, training requirements, and documentation requirements. The Voluntary Information-Sharing Working Group will meet February 28. On January 26, PHMSA issued a notice announcing that the Voluntary Information-Sharing (VIS) Working Group will meet on February 28 to continue discussing the need for and identification of a voluntary information-sharing system among operators. The VIS Working Group, created under section 10 of the Protecting Our Infrastructure of Pipelines and Enhancing Safety (PIPES) Act of 2016, may receive briefings on a variety of topics, including mandate requirements, integrity management, data types and tools, in-line inspection methods, geographic information system implementation, examples of existing information-sharing systems and safety management systems. The meeting is open to the public; registration is available here. DOT updates guidance regarding drug and alcohol testing requirements. On January 9, the DOT Office of Drug and Alcohol Policy and Compliance issued a new Question and Answer providing guidance regarding the reporting of legally prescribed medication that would likely pose a significant safety risk under 49 C.F.R. Part 40, DOT’s drug and alcohol testing regulations. 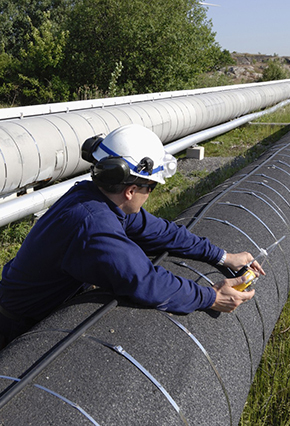 GAO releases report on natural gas storage enforcement. On December 22, 2017, the Government Accountability Office (GAO) released a report to Congress on PHMSA’s efforts to issue safety standards for underground natural gas storage and PHMSA’s strategic planning to enforce such safety standards. GAO recommends that PHMSA continue developing performance goals for its natural gas storage enforcement program and use data and information about budgetary resources to inform and refine performance goals. On January 12, 2018, Congressman Mike Bishop (R-MI) introduced H.R. 4787, the Great Lakes Oil Spill Prevention Act that would impose numerous requirements on pipelines transporting petroleum products crossing navigable waters of the Great Lakes “systems” (defined to include the Great Lakes and specified lakes and rivers). The proposed legislation would, among other things, (1) require periodic status reports to the PHMSA Administrator and Congress regarding Great Lakes pipelines, along with safety recommendations to Congress; (2) require additional maintenance and operating measures: (3) require operators to report violations of such measures; (4) impose timelines for PHMSA’s issuance of corrective actions in response to violations; (5) create additional civil penalties; and (6) prohibit operation of a Great Lakes pipelines installed more than 50 years before enactment. In 2014, the Governor signed Senate Bill 861 expanding the Department of Fish and Wildlife Office of Spill Prevention and Response (OSPR) marine oil spill preparedness and response program to cover all state surface waters. Emergency regulations were issued in 2015 and were readopted in 2016 and 2017, but were not subject to a formal comment process. On December 29, 2017, OSPR issued proposed regulations that would formally adopt these regulations with some revisions to reflect lessons learned from their implementation. The proposal would amend requirements for each operator of an inland facility to prepare and submit an oil spill contingency plan, to submit proof of financial responsibility for oil spills to OSPR for approval, to initiate and participate in tabletop exercises and equipment deployment drills to prepare for oil spills into state waters, and would adopt criteria for oil spill cleanup contractors to be rated by the Administrator of OSPR for providing oil spill cleanup capabilities in all surface waters. Hearings will be held on February 13 and 22, 2018 and comments are due by February 22, 2018. Introduced on January 9, AB1471 would direct public utilities and pipeline operators to reimburse municipalities for all actual and related costs a municipality incurs in providing emergency services to respond to any emergency involving a pipeline. The bill has been referred to the Assembly Telecommunications and Utilities Committee. Introduced on January 8, HB 94 would increase the maximum civil penalty for a violating the pipeline safety regulations to levels not exceeding the amount established by the applicable federal law for any related series of violations. The bill has been referred to the House Rules & Order of Business Committee. Introduced on January 7, HB 3407 would amend the Oklahoma Underground Facilities Damage Prevention Act to amend the definition of “excavate” to eliminate individuals who are excavating on their own property and are not in the excavating business for hire. On January 9, HB1023 was introduced at the request of the Public Utilities Commission. The bill would eliminate the exemption for rural gathering lines from the pipeline safety regulations. The bill has been referred to the House Commerce and Energy Committee. On January 23, The Railroad Commission of Texas Office of General Counsel released a memorandum recommending that the TRC amend the state’s regulations to clarify that the TRC has damage prevention authority over interstate pipelines; require an excavator that damages a pipeline to notify the pipeline operator no later than one hour after the incident; require an excavator to call 911 to report any product release from a damaged pipeline; and provide excavators and operators 30 days, instead of 10 days, after a damage incident to report the incident to the TRC. Introduced on January 10, HB 1188 would require the operator of any natural gas pipeline more than 50 miles long and 24 inches in diameter to perform an independent test of the quality of ground water for each property in its right-of-way and to file a gas discharge contingency plan that is approved by the State Water Control Board (Board). The bill authorizes the Board to adopt regulations requiring testing and inspection of the pipeline and annual retesting of ground water at properties in the right-of-way, establishes penalties for discharging or causing or permitting a discharge or a substantial threat of such discharge, and requires any person discharging more than 25 standard cubic feet of gas to immediately report it to the Board and to local authorities. The bill contains a provision stating that the regulations adopted by the Board will not address matters addressed by the federal Pipeline Safety Act, though some of the regulations the Board would be required to issue would fall into that category. The bill has been referred to the House Committee on Rules. In October 2017, SB 475 was introduced to create procedures for handling complaints about violations of regulations regarding excavations, make certain changes to those requirements, and increase the maximum penalty for violations to $25,000 per day. On January 10, an amendment to SB 475 was added to establish a maximum penalty of $500,000 for a single persisting violation.